Condensed Matter Community is a site-specific curatorial project designed to generate a dialogue about science, aesthetics, progress and entropy. The project will use the Synchrotron Radiation Center’s (SRC) “vault” as an exhibition space to frame a selection of artworks during a transitional period, prior to forthcoming experiments. 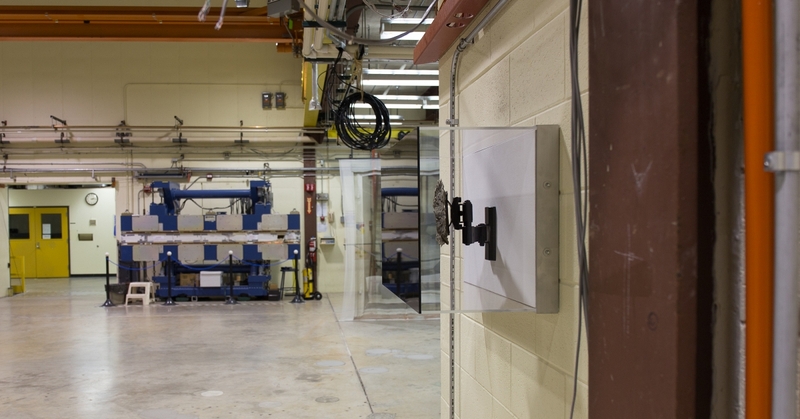 The SRC particle accelerator was part of the University of Wisconsin Madison’s Physical Sciences Laboratories. Situated on limestone bedrock in an below-grade vault, this facility was used for high-energy spectroscopic research for 45 years. Its original electron storage ring, completed Rita Ackermann Cory Arcangel Tauba Auerbach Daniel G. Baird Alisa Baremboym Jesse Benson Jeremy Bolen Sascha Braunig Alex Chitty American Fantasy Classics Katy Cowan Paul Druecke Anna K. E. Assaf Evron Richard Galling Aristotle Georgiades & Gail Simpson Michelle Grabner Evan Gruzis Joel Holmberg Paul Ramirez Jonas Miles Huston José Lerma Kate Levant & Jason Gomez Roman Liška Kylie Lockwood Tony Matelli Scott Reeder John Riepenhoff David Robbins Ryan Sawyer Alina Tenser Daniel Turner Philip Vanderhyden Jacques Louis Vidal Kristof Wickman A section of a synchrotron beam line. Photo: University of Wisconsin-Madison Archives in 1968 and dubbed Tantalus, was an indirect predecessor to Fermilab in Batavia, IL. A larger storage ring, nicknamed Aladdin, was later constructed on the site and reached full power in 1986. It remained a hub of research until it was decommissioned in 2014. In addition to the mythological overtones of its namesakes, the location has a storied history that comments on scientific progress, the collaborative spirit, and the limits of human senses. The multipurpose instruments of the SRC were used in analyzing tree rings, moon rocks, and research into nanotechnology, the biology of cells and DNA, to name just a few examples. Now the center will house DUNE (Deep Underground Neutrino Experiment), heralding a new phase of empirical exploration for the location. Prompted by this transformation, Condensed Matter Community will focus its narrative around the evidence of past experiments and the on-site fabrication of new instruments for future investigations. The SRC’s visually-dense, research-oriented venue offers a context rich in complexity. It is embedded with layers of meaning and human traceability, in contrast to the typical commercial contemporary art environment. The liminal space of the laboratory is a setting outside of the art world proper, simultaneously mythic and real. The windowless vault of the SRC, which ran in three shifts 24 hours per day, denotes both a suspension and accumulation of time. The artists involved represent a spectrum of contemporary practices that range from abstract painting to conceptual photography and new media. Through varied curatorial strategies, a curious slippage between art objects, scientific tools, and personal effects will occur. In this way, the artworks’ relationship to technological processes come to the fore and alternative readings emerge. The conceptual exchange between the history of the facility, the subjective content of objects viewed in-situ, and the ephemera of future experiments will hopefully uncover new areas of discourse.